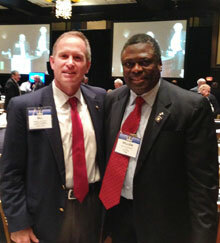 I had the honor to represent District 7600 at the 2013 Council on Legislation in Chicago from April 21-26. It was an incredible experience to be with more than 500 fellow Rotarians serving as delegates for their districts. The Council on Legislation meets every three years. It is the legislative body of RI, which has the authority to amend the RI constitutional documents. The delegates take this responsibility very seriously. It was obvious at the start of the council that delegates had done their homework and they were prepared to discuss the enactments and resolutions proposed at the council. I quickly learned that some items that might not be important to my district might be very important to a district in another country. The margin between yes and no votes on some measures was very slim, and produced passionate comments from delegates. Rotarians have different viewpoints on various issues and topics, and this is good for Rotary. While the delegates did not always agree with each other, everyone was treated with respect. The delegates wanted to make Rotary a stronger and better organization and hopefully our actions at this year’s council achieved that. The council is also a great opportunity to experience several days of fellowship with Rotarians from all over the world. Where else would I have the opportunity to have dinner with individuals from the Slovak Republic, Wales, England, Barbados, Bahamas, St. Croix, South Carolina, and Georgia? One of the Rotarians sitting next to me at the council was from Zambia and we had a great time sharing our thoughts on Rotary. He talked about a bridge he visited in Zambia which has provided improved access to markets, education, and health care. Turns out this bridge was built with a Rotary Foundation grant involving a club in my district the year I served as district governor, 2008-09. Rotary truly makes the world smaller. I’d like to thank all of the volunteers and staff at RI who made this year’s Council on Legislation a successful event. I would also like to thank Rotarian John Germ who did a great job serving as the chair of the council. Most importantly, thanks to the delegates who spent a week away from their families and jobs to work together to make Rotary an even better organization, allowing Rotarians throughout the world to work together to achieve Peace Through Service. This entry was posted in Building community and tagged COL by Rotary International. Bookmark the permalink.